If you aren’t already familiar with real-life escape rooms, they are a type of physical adventure game in which ‘players’ are locked in a room with other willing participants where they have to use elements within the room to escape within a set time limit. Over the past few years, the demand for these escape themed games have become increasingly popular. The Werewolf Experiment is a 60-90 minute cooperative game in which a team of 2-6 players solve puzzles, crack codes, and find hidden objects in order to escape from a mad scientist’s plot to turn them all into werewolves. The project launched on February 3rd, 2016 and managed to reach its initial goal and base funding in just 14 hours! Juliana and Ariel are ‘obviously, completely obsessed with escape rooms.’ But being ‘avid at home gamers’ eventually lead them to the create of their latest project. Escape rooms are notoriously expensive, Juliana and Ariel ‘wanted to host an at-home version to save some money.’ If you’ve ever been in one before you’ll know that most escape rooms run on a pretty tight schedule, meaning that after the time allocation and once you have solved the puzzles (or not), you need to leave immediately so another group can come in. Shocked when they were unable to find an at home escape room, the decided to make one themselves. The biggest inspiration for the project has been ‘all of the excellent escape rooms’ the pair have ‘had the pleasure to experience’. Internally, their biggest challenge was ‘making the game as physical as it is’. They said that they ‘really didn’t want this to just be pen and paper puzzles’. They wanted to do everything they could to ‘replicate the physicality of brick and mortar escape rooms.’ And while it took a lot of trial and error, they are ‘really pleased’ with the volume of physical puzzles they were able to fit inside the box. Externally, their biggest challenge has been getting people to view their game ‘as an experience, like a night out at an escape room, rather than a typical at home game’. The game is considered to be on the high end for a tabletop game because of all the physical components and the complicated way they are put together. 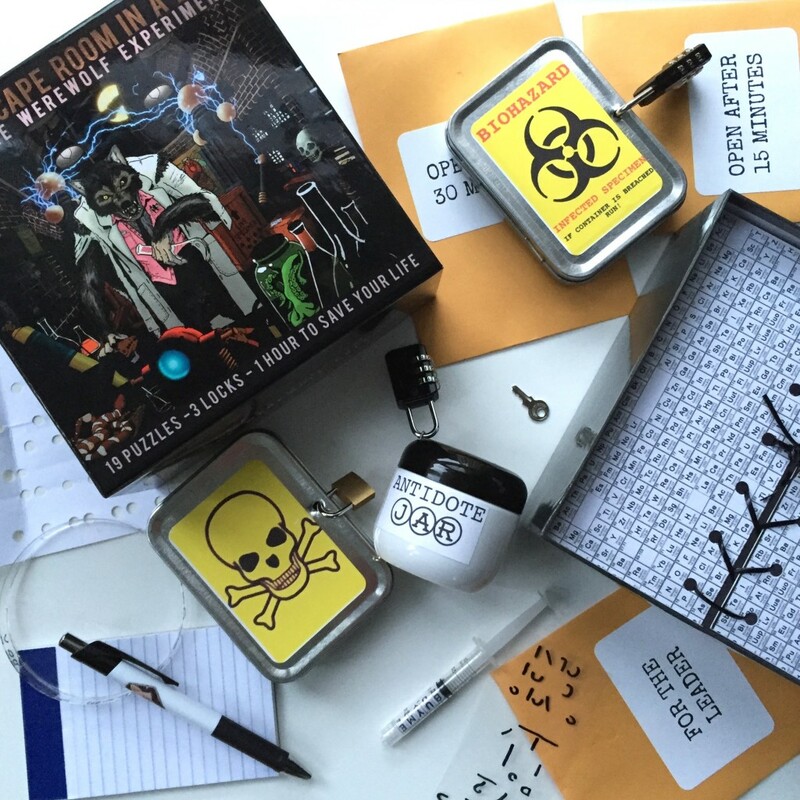 Prior to the launch Juliana and Ariel reached out to ‘some of the biggest board game and escape room reviewers’ and asked them to take a look at the game. The response was pretty much unanimous with most of the testers loved the game. They think the process helped give the project legitimacy, ‘since we are first-time creators’. And many of the reviewers continue to advocate on behalf of the game. A post from Joel Eddy of Drive Thru Reviews meant that The Werewolf Experiment was the number two board game on Reddit the day that they launched. Later this week the game will be featured in Newsweek, ‘thanks to David Spira from Room Escape Artist’. Juliana and Ariel said that one of the most beautiful things about Kickstarter is ‘the chance to actually see and interact with all of your customers.’ They have sent personal thank you notes to every single backer and ‘love hearing what everyone has to say about the game’. As of now, the project is just shy of 2000 backers, and while the duo knew they had a great idea, that their playtesters loved. With a crowded marketplace with a lot of good content and it can be hard to get noticed. That’s why they were ‘so thrilled for all the support and so grateful for every single backer’. The team described the design process as ‘crazy’. The duo decided it was really important that ‘all the puzzles interact with one another’. So they had a massive map with note cards that spelled out how everything would work together and what connected to what. As they started play testing changes were inevitable in order to get the game to a place where it is ‘consistently enjoyable and constantly challenging but not impossible’. Having made well over a hundred changes since starting, they are ‘really proud of the game’ how it exists now. The artist Gage Ullman designed a comic book style box for the prototype, through play testing they’ve decided to go in a more minimalist direction, so Gage is redesigning the box and all the paper components in the game for a ‘sleek and cohesive’ design that will still ‘invoke the mystery of the Escape Room In A Box experience’. The duo have so far found that the nature of the game means that people are eager to discuss their experience playing and because no two people play the same way they have high hopes that a lot of vloggers will film a summary of their experiences after the game. ‘Thrilled’ that they unlocked a stretch goal which will allow them to have a forum and a leader board, it now means that the community of people who have played can all discuss their experiences together online. Having just unlocked their final 100k stretch goal and announced the next game in the series: Escape Room In A Box: The Magician’s Spell Book. There were lots of puzzles that weren’t able to make the cut into The Werewolf Experiment game, so Juliana and Ariel are ‘excited to have received this response and to be able to continue crafting games in the series’. They are eventually hoping to do a “light” version that would be 15-20 minutes and for 2-3 people. Where they’d be able to sell at a lower price point, making it an excellent “gateway game” for people who are curious about the series. They also want to make some games that are easier and targeted for children. This project will be funded on Fri, Mar 4, 2016, 5:01 PM GMT. The MSRP for the game will be $60+Shipping, but the Kickstarter price is only $45+Shipping. Early supporters will save $15 AND get the refill pack for free! Show Juliana and Ariel some love here! What do you guys think of the game? Have you ever been in an escape room before? Tell us below! We just wanna say thnx to you 4 creating this cool blog and keep going the great work! I LOVE ESCAPE ROOMS ? I’ve done three escape rooms, they were all amazing – i did one in Japan too! Not sure how a game would work, but i look forward to reading reviews. Finally became backer! I can’t wait for this game to arrive! I really like how they gave us a free wallpaper too! II love the candle idea they posted about… not sure about the shipping, but it’ll really add to the atmosphere. I’m one of their backers, i’m so excited to bring this to the table. Me, my family and friends are big fans of Escape Rooms, we’e done around half a dozen – even the kids love it. I love the idea of bringing it into the home! My family are all really into games and we once did and escape room, we really enjoyed it, it proved to be a great birthday party! I would love to film this for my youtube channel, i just don’t know if the format would work. Going to be fun to bring this to the table! I have a gaming night every Thursday, this would really suit us! How many uses does the refill pack provide? I couldn’t find it anywhere?! Looks great though.. It has a pdf of all the puzzles that you can print out as well as instructions on reassembly and at least five of the consumable elements. But you can source those elements fairly easily online, so even after you have used them all up you can just buy more and keep hosting!